I’m stumped about how to introduce this week’s home tour to you. The word that seems most appropriate to describe it is happy, but I’ve spent more than a few minutes trying to think of a better one. I mean, there’s a cozy nook! And a chalkboard! A wall of vintage maps! Over-sized art! A chubby baby! Suddenly, mid-smile, I realized that we can’t do much better than happy, can we? Happiness is a design style we should all covet. So welcome to a glimpse into Rae’s happy home and happy family. Q: Tell us all about the happy family who lives here! A: What a big question! I’ll start with the babe and work my way up. Griffin William (G Dub) just turned one, and has the Scandinavian look like his daddy. Aside from his cute packaging, he is super sneaky and tends to do things when people aren’t looking. For instance, it was a few weeks after he started crawling that we actually saw him do it. No joke. 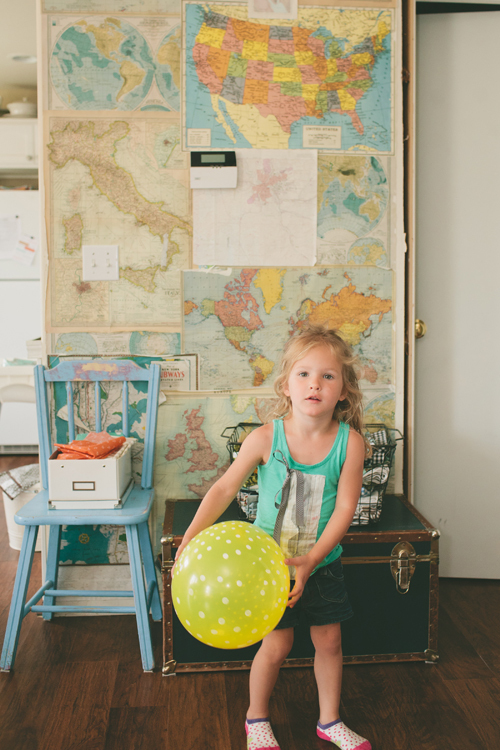 Tilly Jane (Matilda) is our almost four year old wanderlust. You don’t know where she is going or what she is up to, but you know it’s going to be good. Or naughty. Like when she visits the other team’s dugout after a game to mooch a snack before coming to mooch one from her brother’s team. “Tilly, where did you get that doughnut?” She is also our encourager. If you want to feel amazing about yourself, go talk to Tilly. Seriously. However, she has zero regard for personal space so I recommend a phone call. Espen just turned six, and if I had to pick a child to spend the day with, it would be this little dude. He gets excited about everything, small or big. Waking up (excited), getting a strawberries and crème at Starbucks (excited), vacationing at Disney Land (excited), having a friend over (super excited). In addition, he is the resourceful child that plays with Legos for hours, cracks the password on my iPhone, and gets the family laughing when we need it most. Ozzie is our tween – 11 ½ – who is entering middle school. It’s been very surreal to watch him grow up because I was 20 and in college when I had him. We’ve been through the ringer together, and I’m impressed with how amazing he is every single day. Most of his spare time is spent playing sports or click-clacking his Kendama around the house. He also still does crafts with me, holds my hand in public, is really picky about who his friends are, and has little interest in girls. Pretty much a dream come true for this mama. Then there is my husband Johan, who I met in college and knew as our school mascot. As you might imagine, he is loud and playful and full of fun. He spends a lot of time coaching, can wrangle kids like no other, and comes in handy at birthday parties. We work together really well because he has little interest in style and design but knows how to build, wire, and fix things. He is a fireman and was on shift on the day we took pictures. Q: Where do you make your home? A: We live in a little suburb of Seattle called Bonney Lake. Our town is full of young families raising children, which is one of its greatest qualities. Tons of parent helpers in school and moms wandering around Target passing time before preschool pick up…you know? There are also lots of parks, you-pick farms, markets, antique shops, and activities for little ones. Plus a beautiful lake a few minutes from our home and a ski mountain less than an hour away. Q: How did your home become yours? A: At the time we bought our home, we were living with some close friends. It was a really fun time, but we also didn’t want to overstay our welcome. Even before we had the financial side of things in order, I started house hunting. During that time I drove by a blue modified A-frame home with a For Sale sign in front almost daily, but wasn’t impressed so I never bothered to stop. Later on in our search, Johan got involved and found a house he wanted to view. Much to my surprise, it was the blue house I didn’t like! I begrudgingly went in, but the second my foot crossed the threshold my opinion changed. I loved it. It was where we were supposed to live and it had nothing to do with the lack of storage or builder-grade everything or dirty cream colored walls and carpet that the previous owners left. I have no other way to describe it except that it felt just like home. Q: How would you describe your design aesthetic? Has it changed since you’ve had kids? A: I would call my style casual-eclectic with a side of clean-modern. I think my mom would have described that as my style even as a young girl. So while the kids haven’t changed that, after having them I did spend some time trying to adopt the cottage look. However, I didn’t make it much past the blue-gray cabinets, bead board, and silhouettes. The one thing that may never change about how I design is my love for paint (not to be confused with the act of painting!) and use of white, gray, and black. I love using these colors as a base and then adding splashes of brighter color. It also makes it crazy easy to change color palettes for the season or whenever you get bored. Just swap out curtains and throw pillows, and you’re more than halfway there! Q: Describe your favorite spot in the house. What do you love most about it, and how do you spend your best time there? 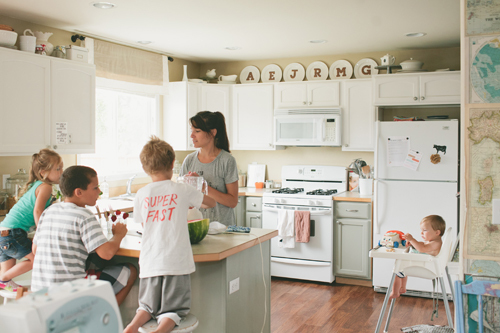 A: Hands down, my favorite spot is the little nook in our kitchen. I’ve spent countless mornings nursing babies from that spot while directing traffic and watching the kids eat breakfast. It used to be a built-in desk with zero storage, but it didn’t function very well so we ripped it out, added a cabinet to hold crafting supplies, a bench, comfy cushion, and pillows for a cozy seat, and three rolling bins for the kids’ shoes. What I love most is that it’s completely handmade and we use the area for so many things on a daily basis. Q: What’s your best DIY you’ve accomplished in your home? A: It’s so simple, but painting the cabinets in the kitchen and adding handles made the biggest difference for me. It took the blah out of my downstairs area, and even made it more fun to cook. I highly recommend this DIY if you want to freshen up your kitchen or any room with outdated cabinets. Even if the idea of ruining them terrifies you or you are not sure what color to pick, you still need to do it! Sorry for being bossy! I guess that would also be my advice to those who dream of attempting a home project but are too scared to start. Just do it. Having a DIY project go awry is better than having beautiful ideas rumbling around your head and not bring them to life. Trust me. You will figure it out if things do go south! Q: You’ve got your own company. Tell us all about it! And how do you separate home and work? A: ARMOMMY is a lifestyle company for moms that I started with my mom. Our focus is on design, function, and homemade goodness. A large part of the company involves our blog, but we also offer a lot of other goodies. Like printable designs that everyone should check out. Products such as the smib, door bumper, and reusable snack bags that my family uses on a daily basis. We offer design & branding services for mompreneurs. 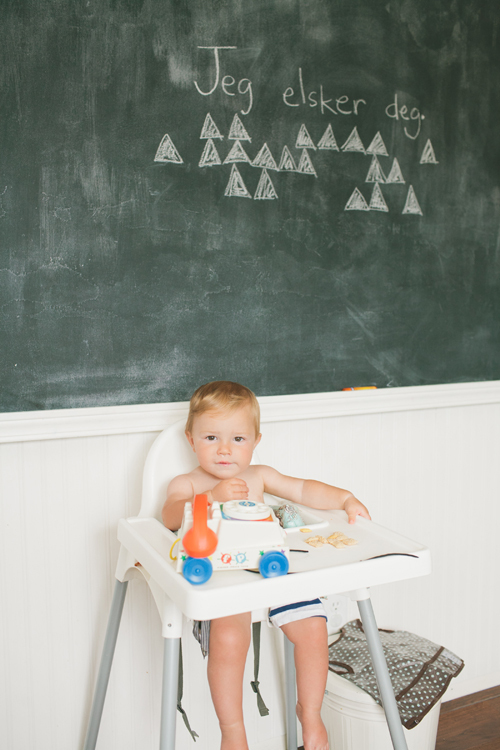 We have a monthly meal planning subscription called the spread that makes mealtime oh so easy. And threads video sewing classes, which are our gift to everyone who is dying to sew but could use a little more than a few pictures in a tutorial. You are not alone! Balancing work and home? Again, another huge question! I could talk about this for hours, but the short answer is quite simply: I do the best I can. 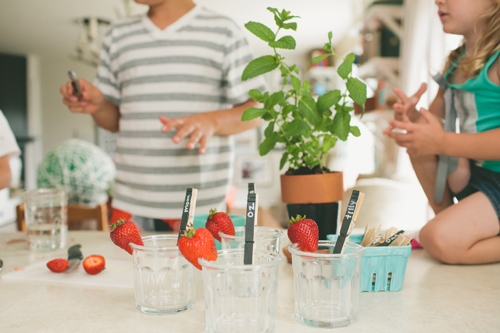 Luckily, I can involve my family in a lot of the DIY and cooking projects we do. However, when it is clear that my kids or husband need more than a half-hearted head nodding and “uh huh,” I close my laptop and step away. My extremities might be able to multi-task, but sadly my brain is terrible at it. So, I schedule chunks of time during naps or when my husband can help with kids to finish emails and other things that need my full attention. 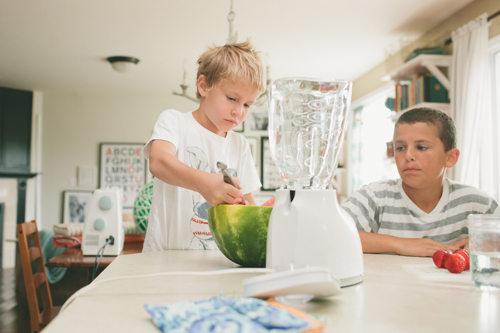 Q: What are you trying to teach your kids with the design and intention of your home’s decor? A: We try to instill the importance of relationship, creativity, and teamwork. Johan and I do our best to make our home welcoming, not just for our friends and our children, but also their friends and other church or sports groups in which we are involved. The kids also share rooms, so there is a lot of time for bonding and getting into trouble together. Instilling creativity comes pretty naturally. 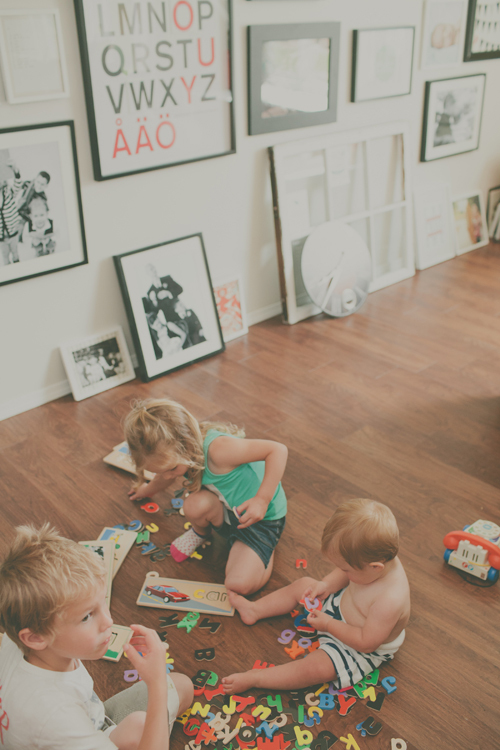 For me, it’s all about letting them make a mess, try new things, display their projects, and have a say about how their space looks. The other part of making a home welcoming is taking care of it. This is where the teamwork comes in. Because our schedules are so all over the place, we don’t stick to a specific chore schedule. 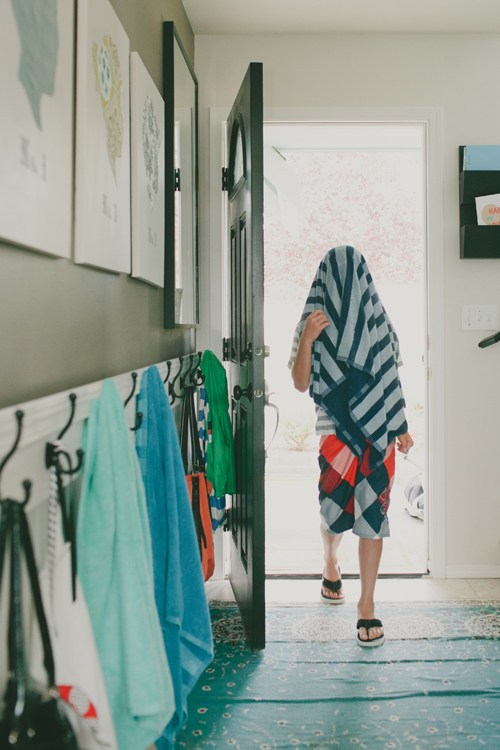 Instead, the kids have their responsibilities – clothing, bed making, and taking care of their belongings – and then they chip in when we ask and are usually good sports about it. We also try to make tasks they can do themselves really accessible, such as storing breakfast cereal in apothecary jars on the kitchen counter and adding shoe bins close to the entry. Q: What do you hope your kids remember most from their childhood home? A: I love this question, but have no idea how to make it not sound cheesy! Here goes! I hope they remember the fun and laughter that was made in our home. Also, I hope they remember how valued and involved they were in our home, from cooking and cleaning to helping younger siblings or Mom and Dad with projects. And because I’m a crafter/ designer/sewer, I really hope they remember all the handmade items! I wish I had known to trust in God’s timing more. I tend to jump the gun a little (ok, a lot!) and in doing so miss out on sweet life moments. Like when I was a single mom or when we started ARMOMMY five years ago and I was determined to make it amazing overnight, or the period of time in my marriage when money was scary tight. It’s all about timing, and His is way better than mine. I also wish I would have known that making something special does not mean making it perfect. Life is all about the outtakes! I told you, didn’t I? Happy. Thank you so much, Rae, for sharing your space with us! And I know my readers are going to find themselves lost in the loveliest way on ARMOMMY! So many brilliant ideas and inspiration. Friends, Rae was pretty adamant (bossy, really!) about repainting your outdated kitchen cabinets. Have you ever? It’s one of those daunting DIY projects that scares us all, but I think Rae is exactly right: the reward is worth it. I’d love to hear your cabinet renovation experiences and worries. Who knows? Maybe we can start a little painting revolution! Gorgeous photos by Stacy Jacobsen. Previous Post « Happy Ethiopian New Year! i wish we could have seen different rooms of the house! I have been thinking lately, “Where are the real homes with more than one or two real children that aren’t babies. Where are the homes where the people really live in them?” Thank you, thank you! There is such a difference in a home when your kids start getting older and when time and money for all the fancy doo dads get short. When the amount of junk that walks in your door threatens the crew from Hoarders to come a knockin’. I love this episode. I also love that she lives in Bonney Lake, not a half hour from where I am in Maple Valley, WA. Also. Just repainted my kitchen cupboards. We put bead board on the inset, painted it all frost white (kind of a blue-ish white) and added gorgeous blue glass knobs and pulls. It makes my heart happy to walk into my yellow kitchen and see those knobs. So, I very much second the call to paint your cabinets! But expect a cascade effect. You’ll realize that your standard white appliances don’t match the cupboards and you need new ones, you’ll have to put up new molding to match the cabinets, but before that you’ll have to put in a new tile floor, and then you’ll need new furniture and dishes. My husband just LOVES my home “improvement” plans. Love this house, the lovely big kitchen!!! The couch!!! And the adorable kiddo’s … Beautiful!!! I love this house, and her approach to life. Thanks for sharing! My husband is also a fireman, who has a knack for building, while I have one for design. While we don’t have kids yet, it gave me a glimps of what life could be like for us later. This is one of my favorite features! I’m so glad that Rae included her family in their pictures! I truly makes their home come alive!! Gorgeous family and what a happy home! Thanks for sharing! What a beautiful home! I have to second her insistence on repainting your own cabinets–it is time consuming, but since they are individual doors, you can break it up into smaller chunks, and it looks so good once you’re finished! We’ve been considering painting our kitchen cabinets, but are hesitant because of the chemicals in paint…and we’re not sure if non-VOC would do the job. And it’s a really big kitchen. And we don’t really love the layout anyway. Lots of excuses! love her daughter’s kid size clothing rack! is that homemade or can it be purchased somewhere? Yes! I wondered about the clothing rack too. My girls’ dress up trunk is just not cutting it, everything everywhere anytime they need even one thing to dress up in. I also wondered about the black and white floor in that photo. Rae, you are delightful… I just looked at your website in hopes of being able to find an option to purchase a customized version of your numbered silhouettes for my growing family… Like how I assumed you made those? :)) And I’m guessing out of fabric? Love-love-love! Where can we find them? I love that your Living with Kids post highlighted the personalities of each one of your children just as much as how you live. For me, those layers are interdependent and truly the reason our house is home. I love design and as a second career would want to be a buyer for any home store but in all honesty, our life – from floor to ceiling – would have never had this much personality and life if it weren’t for our little sparklers. So nice meeting you here! True dat, Christi!!! You are so right on. I did make the canvas silhouettes and have been promising to share a tutorial so head to our site and sign up for emails or check in when you can! Yes! PLease a tutorial for the silhouettes! I searched all through your blog for it. I will sign up to get your emails so I know when you post it! I LOVE LOVE LOVE your home. Finally one that is magazine worthy but doesn’t look overly staged and perfect. 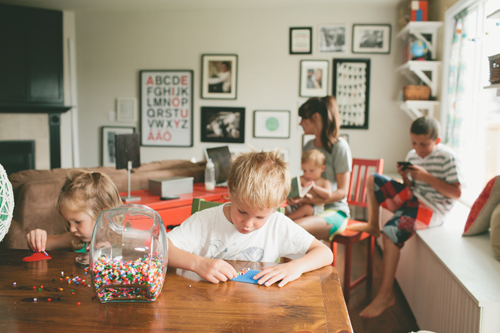 As a mom of 4 kids, it is really great to see a cool home that houses 4 kids! Nice job! 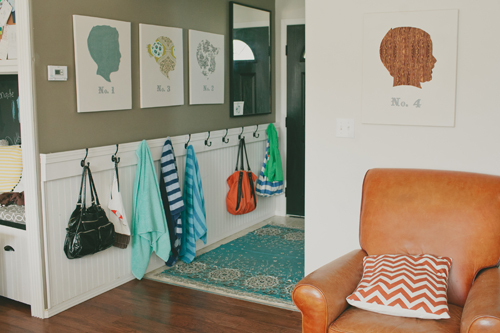 I love her intentionality with clothes hooks at kids height, nooks, chalkboards for the kids. beautiful! Painting your outdated cabinets is time consuming, but sooo worth it and much less expensive than replacing them altogether. I loved this home tour, especially since it wasn’t just photos of immaculate rooms with great style. I loved seeing the space being lived in! Many thanks for this series…it is one of my favorites and I get so many ideas. I am loving the coat hooks on the way in from the front door, BTW. I am trying to figure out if there is some way I can incorporate that into my current house! What a beautiful home, perspective, and blog! Thanks for introducing us, the inspiration was wonderful today!! 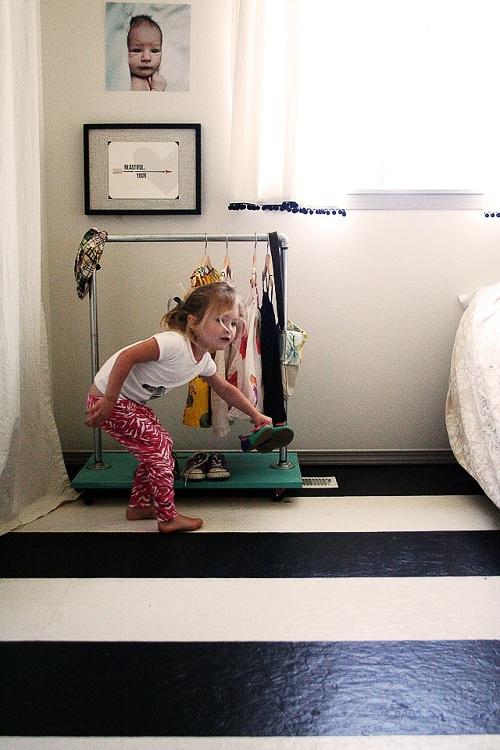 I think this might be in my favorite top 3 of your Living with Kids series. Rae seems so down to earth and her photos didn’t looked staged, but showed her home in the midst of life. Love it. Very beautiful home and family. God’s timing? One thing I am constantly trying to remember. Thank you Rae for sharing a glimpse of your home! I can think of no better compliment than to describe a family home as “happy.” I would smile for days if that was the best word someone could come up with to describe our home. After all, isn’t that what we all aim for as mothers; to raise, healthy, happy kiddos?! If home is where the heart is, then happy (and happily decorated homes) homes are a fabulous starting point! Gabrielle, I’m honored to be featured on your Living with Kids series and oh, so humbled by the comments. You’ve got good peeps! “Life is all about the outtakes” – that’s a motto to live by! What a fun and harmonious space. Very inspiring and I love how kid friendly everything looks! Ah! This is my favorite home tour so far–it’s such a lovely, real-life home. “Happy” was the perfect word choice:). Rae seems like an awesome person, and I love the things she said about working from home. They really resonated. I’m so inspired to tackle the DIY project I’ve been dreaming about (but too intimidated to try). And I would love to find out more about that mini clothes rack. My boys’ costumes need some major wrangling. Love, love, love the whole thing! My favorites are the built in bench in the kitchen (genius! 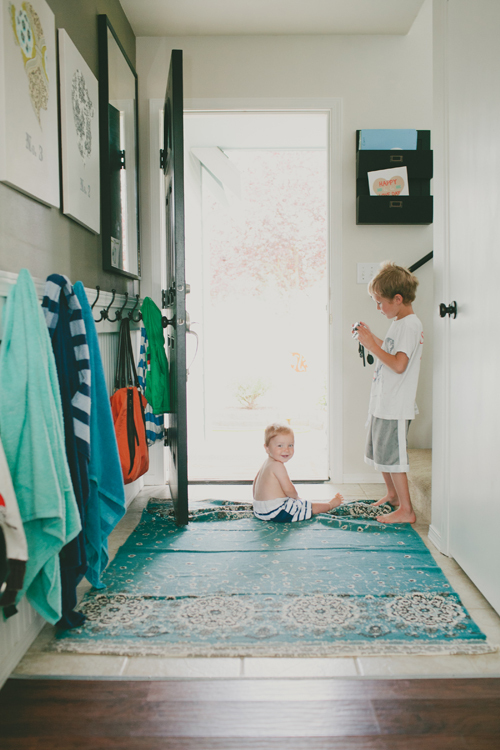 ), the quotes at the end (so encouraging and necessary for me to remember as I am just in the early phase of my new business), the wall of maps, and the wonderful, creative, and fun vibe throughout her home and the pics of her family. I agree with the other commenters, too, about it really appreciating it being real!! 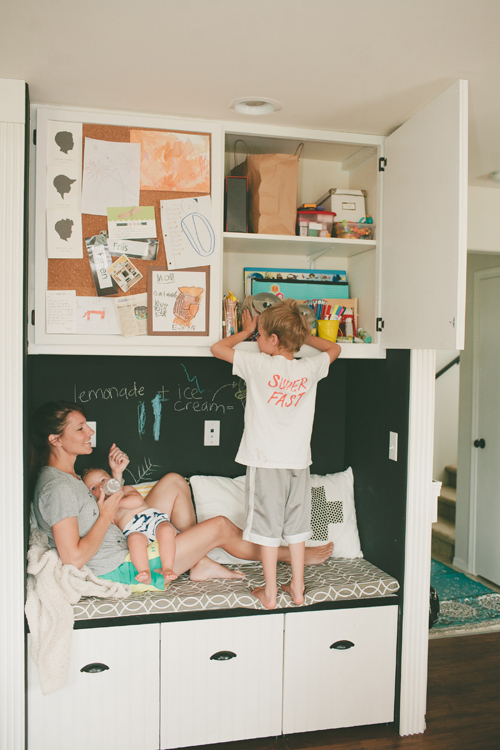 Aw, I just love her take on life and living w/ kiddos! You’re right, “happy” is the perfect way to describe their home. And her answer to your last question? Beautiful. I LOVE this. I’m a huge fan of Rae AND this entire series so this was especially lovely to see today. I love this design style and how casual and comfy it is. :) Thank you for sharing! This house is so livable and cozy, but full of light (and children). I’m happy just looking at it. Your home is lovely, but the way you describe your children made me weepy. Beautiful! My favorite home of the series yet! I hope we can see more another time once the upstairs swap is done! PLEASE PLEASE PLEASE tell me- where did you get the silhouettes? Did I miss it? i love your house! and your words about your family and work and time! everything spoke to me. we have to trust in god’s timing and do the best we can…though, like you – i fight it at times. thanks for saying what i needed to hear/be reminded of. and i second everyone’s love of the dress up rack…will be making one for my daughter’s room when the remodel is done. Those maps!! That nook!! The mini clothing rack! Those beautiful children!! Happy is a great word to describe this home. Just all around lovely! delightful feature. I love that the pictures of this house show it in action – toys on the floor, a mommy with no shoes on, kids acting like kids. Ah, so inspiring but not at all intimidating! Not only is this home happy. these hearts are so happy. And Tilly’s personal space comment…so funny! I’ll never forget her under my hooter hider asking me what I was doing. Love this one, too!! I feel like I know Rae and her precious family. 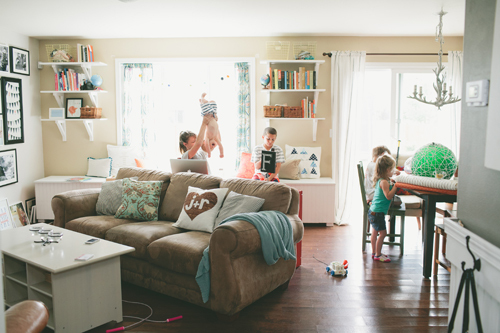 I, too, have a CRAZY & chaotic home (complete with 4 kiddos & a home business) and making it feel “happy” for everyone is something I endlessly struggle to do! :) Thanks for the inspiration! these are always my favorite posts! i get sucked in every time. love the peeks into family homes with style. would be such a fun coffee table book right? Oh I’ve been on the fence about painting our kitchen cabinets since we moved into this house back in Feb. We are going to do a full kitchen remodel, but not until either next summer or even the next next summer. Every time I convince myself that we should have grey cabinets until then, I talk myself out by saying we’re tearing it all out eventually anyway. Might have to just take the jump! Love the Norwegian for ‘I love you’ on the blackboard…we just moved to Norway (my husband’s homeland) and will be setting up our own new house in T-19 days…I can’t wait and have been soaking up inspiration with my eyes everywhere we go…lovely insight, and beautiful Scandinavia names;). I also LOVED this tour, and would also love to see more of the house – especially the outside. Is it still blue? Thanks for sharing what a real-life house with a beautiful gang of kids looks like. It’s inspiring – even more so than staged homes. Great house, great family. I appreciate it when a home which melds style and reality (budgetary concerns/ no $5,000 sofas) is shown. Very inspirational, and I think Rae has pushed me back towards the “paint the cabinets!” side of our current home upgrades. Love these photos! Especially the little seating area under the cabinet. Must have one of those in my future house. and quite frankly, this family! what a great, homey, real home tour. i loved that rae and the children were in all the photos. it was a happy house… and a happy read. and the “what has life taught you” moment… relevant to me! my only regret… more pics… more of the house… upstairs, more rooms, exterior, yard, etc!!! I have now repainted my cabinets twice in the 5 or less years we’ve owned our home. Here’s what I have to say about that…do it! And enjoy the process, and be okay to hate it…and in the end if you don’t then bravo! It really teaches you alot about paint/colors/ spaces and it gets you to a place where you know exactly what you really want…I am currently in the midst of changing them again, (the third time!) but I KNOW this time how to pick it. It’s kinda like boyfriends…you gotta date a few of the wrong guys to know exactly what the right guy will be like. :) Happy Painting! Thanks for the tour of your home and life – lovely. 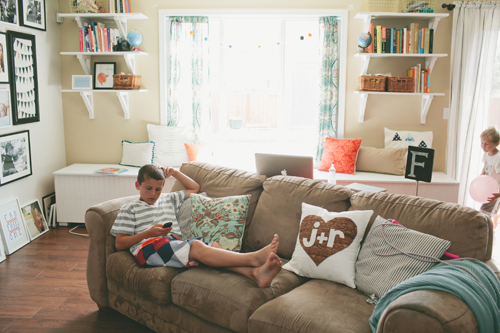 I so love that j+r pillow on the sofa. It is just the wedding gift I need for my sister. Did you make it or buy it? Lovely home and life indeed! Your kids will surely grow up into happy, well-formed people. Perhaps you should give them each a http://kidsgowhoa.com/my-life-story-diary/ so that they can keep a track of their entire life growing up! I was looking for the over the door bumper but couldn’t find it on the site. Can you direct me to the link?